2017 was the worst year on record for California wildfires, but 2018 is shaping up to be worse. According to reports, over one million acres have burned so far this year, with blazes like the Carr Fire and the Mendocino Complex Fire yet to be fully contained. The devastation is devouring resources at unprecedented rates and thousands of additional firefighters are being brought in to help contain the damage—adding strain to an already strained emergency response system and increasing the need to think beyond now and what’s happening next. When it comes to disaster management—and particularly when it comes to wildfires—every second matters. The efficiency of emergency systems can be heavily attributed to the correct allocation of resources to demand centers. That’s why having access to information like the extent of damage to property, roads, other infrastructure, and the ability to get help where it’s needed most, has such a severe effect when not dealt with in real time. For example, the fast assessment of community devastation leads to the better prioritization of response and recovery activities, such as providing shelter and other supplies for people who’ve been displaced. Badly-coordinated efforts in these moments of stress can turn groups of displaced and traumatized citizens into disgruntled and disorderly detractors. 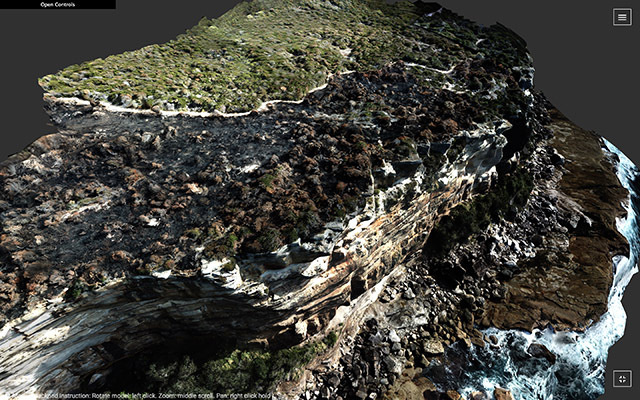 Given the abundance of technology available today, it’s unacceptable that modern firefighters do not have access to a clear, real-time visual representation of their resources and damage to the land. 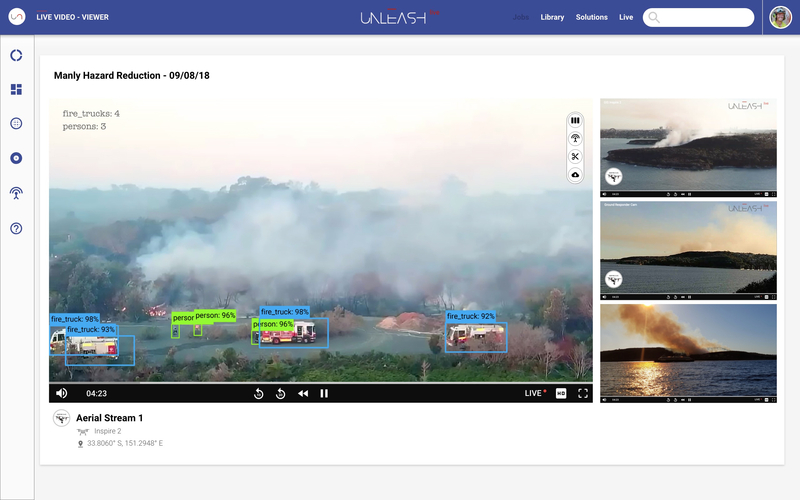 Unleash live, a platform that connects media captured through aerial drone cameras, other robotics cameras, and sensors to the cloud via AWS for artificial intelligence, partners with emergency services such as fire services to bring an intelligent remote vision to an emergency unfolding in real time. This capability can also be applied to hazard reduction, a powerful tool that firefighters can use to reduce the risk of an outbreak. However, with hazard reduction, there is the added complexity of a planning phase. There are three phases involved in the planning of hazard reduction, and for each, the Unleash live platform delivers tailored output. Unleash live utilizes the power of the AWS platform to allow many remote devices, such as drones, IP cameras, sensors, and GPS trackers to be set-up, activated, and managed via a centralized secure command hub. The two-way communication from the cloud to and from the remote intelligent machines has less than 100ms latency globally. Working with AWS Cognito, AWS IoT, and AWS DynamoDB, drones can be linked into the secure Unleash live cloud service and start providing real-time remote vision to the firefighters as well as other units collaborating in the response effort. To top it off, Unleash live writes all HD full videos and stereo audio to the user’s secure S3 account, making it fully searchable by tags created with Amazon Rekognition and archived into Amazon Glacier over time. The NSW Rural Fire Service (RFS) in Australia conducts more than 50 regular hazard reduction events every day in peak seasons. Sydney prides itself on having more than 400 parks and wildlife areas. 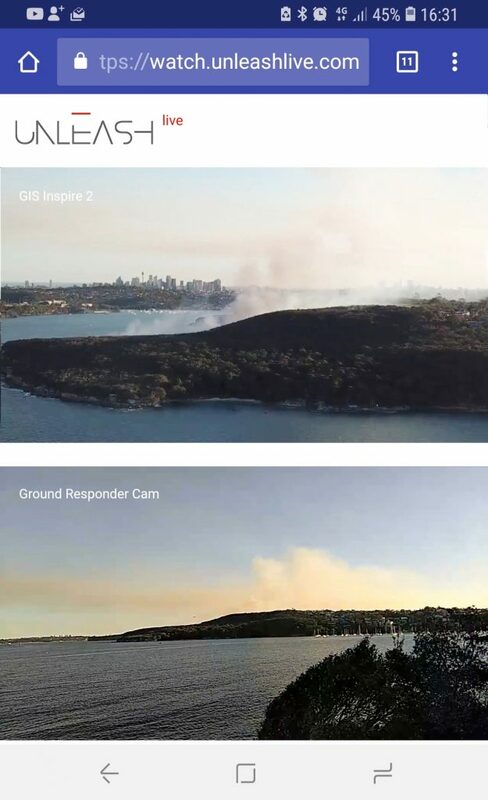 On 9th August, there was a reduction effort in the heart of Sydney for an eight-hour burn at 10:30 am which went “perfectly to planned” as remarked upon by the fire service spokesperson. In an event such as this, Unleash live has the potential to be the eyes and ears control center, from virtually any vantage point that has a connected camera or mobile device as demonstrated below. The Unleash live dashboard becomes the centralized location for controlling a large number of video streams from personal, operational equipment, i.e. fire engines, helicopters and other sensors, all viewable within the browser. Potentially there are many elements within the execution of hazard reduction that can go wrong, that can lead to large-scale property damage, environmental cost and tragically, human life. Unleash live uses real-time video and sensor ingestion capabilities to assist in reducing the chances of disaster striking. Historically, emergency services have been heavily reliant upon audio as their primary method of communications. By coupling audio with video streams from multiple locations and placing them geographically on a current map interface, the platform provides situational awareness for the command center. Emergency management shares attributes with a number of adjacent industries who also have the need for situational awareness, constant visual and audio feedback, collaboration and documentation. Such industries include large sporting events, music festivals, parades, marches and community events. Learn more about Unleash live at their website.